Jon Gann (left), director of the DC Shorts Film Festival, congratulates Fred Perry (right) on winning the DC Shorts Screenplay Competition. Photo courtesy of DC Shorts. Think screenwriting is a young person’s game? Fred Perry proved otherwise as he won the 2013 DC Shorts Screenplay Competition. The DC Shorts Screenplay Competition is a very different kind of screenwriting competition. 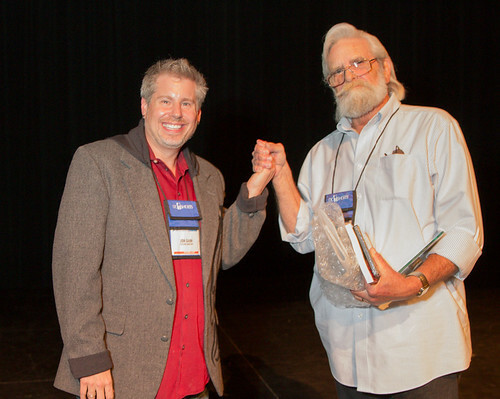 A panel of local judges (including me) reviewed 145 screenplays and selected six finalists. These finalists then received a table read by local actors before an audience of more than 150 people at the Atlas Theater. The audience then voted on the winner. They selected Five Days in Calcutta by Fred Perry of Los Osos, California. For winning DC Shorts, Perry receives $2000 to turn his script into a short film plus automatic entry into the festival next year. Five Days in Calcutta is a wry and funny comedy about a failed artist, a suicide attempt and a dog that may or may not be dead. One scene, two actors, one location – about as simple as you can get. But what really shined in the production was the dialogue. Before he took up writing, Perry was an actor. His lines have a naturalistic quality that are a delight to hear read aloud. The script is filled with crackling exchanges between a pair of grumpy old men that left the audience laughing. At the end of the reading, Shenanigans, the winner of last year’s screenplay competition, was played for the audience. I read this script, watched it being performed, and now it’s a hilarious short film – can’t get more inspiring than that. This process of making dreams reality is what I love about DC Shorts. Look for Five Days in Calcutta on the big screen at DC Shorts 2014! And if you’re a writer, stay in touch with DC Shorts and see your short script turned into a movie. Bonus: see photos from DC Shorts Screenwriting Competition. Previous Previous post: Can You Find Success as a Filmmaker Outside LA?